The East Metro Symphony Orchestra (EMSO) is proud to announce the first program of its tenth anniversary season. A Joyful Noise will be presented on Sunday, October 28, 2018 at 3:00 p.m. at King of Kings Lutheran Church, 1583 Radio Drive, Woodbury, MN. Admission to this concert is free. Free will offerings in support of the orchestra’s work in the community are always appreciated. 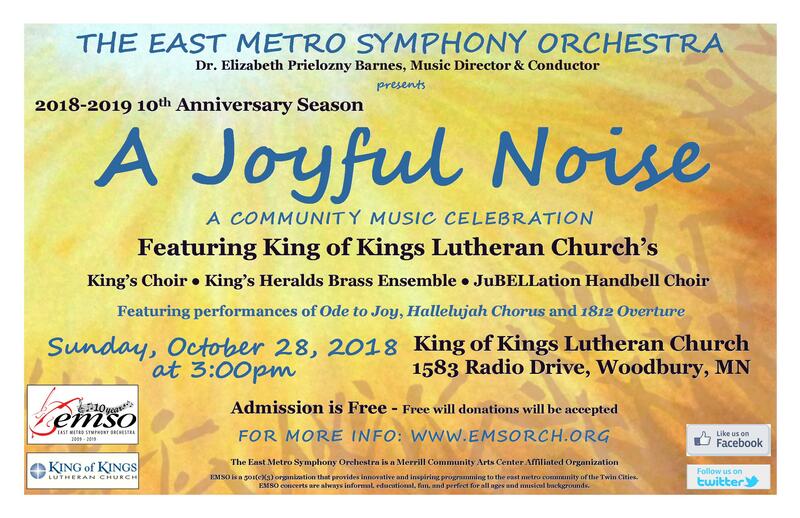 To kick off EMSO’s tenth anniversary season, A Joyful Noise will be a celebration of community music and is the second time EMSO has collaborated with King of Kings Lutheran Church’s various music groups. Highlights will include performances of Hallelujah Chorus from Handel’s Messiah and Ode to Joy from Beethoven’s 9th Symphony, Tchaikovsky’s 1812 Overture, and Grieg’s Holberg Suite. The concert will also feature special performances with the King of Kings Lutheran Church’s King’s Choir, King’s Heralds Brass Ensemble and JuBELLation Handbell Choir. A meet-and-greet with orchestra members and refreshments will immediately follow the performance. The East Metro Symphony Orchestra celebrates ten seasons of providing innovative and inspiring programming to the East Metro community. EMSO concerts are always informal, educational, fun, and perfect for all ages and musical backgrounds. To learn more, visit us on Facebook, Twitter or explore the website.